Join Ted Dolan, Site Manager at Fort Anne National Historic Site, Heather Leblanc from the MAPANNAPOLIS project and Sara Beanlands from Boreas Heritage for a fascinating presentation on one of the most exciting archaeological projects currently ongoing in Nova Scotia. The Garrison Graveyard is one of Canada’s most historically significant burial grounds. In includes an unmarked Acadian cemetery, in use before 1686 until 1755, and a British cemetery, used as a community burial ground from 1710 until 1940, where over 230 headstones remain. Many additional gravesites are unmarked, and the graveyard probably contains 2,000 or more burials. The extant headstones have been recorded on an interactive web map as a joint project of MAPANNAPOLIS and Parks Canada. 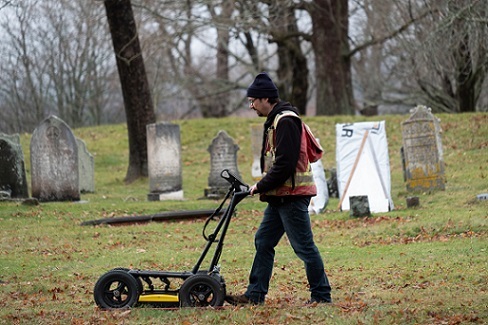 The primary objective of the 2018 Garrison Graveyard investigation was to determine whether or not Ground-Penetrating Radar could detect unmarked burials within the graveyard. GPR can detect subsurface anomalies up to three meters below ground without causing disturbances, which is especially important in the context of a burial ground. In an effort to target the location of the early Acadian cemetery, as identified on historic mapping and through parish records, Boreas Heritage, another partner involved in the project, geo-referenced available 17th and 18th century mapping using Geographic Information Systems software. Light Detection and Ranging data was analyzed in an effort to identify buried features in the vicinity of the cemetery. Based on the results of the GPR survey, Boreas Heritage identified numerous anomalies believed to represent the remains of unmarked burials, thus achieving the primary objective of the investigation. The application and integration of various modern technologies also revealed the presence of additional historic features within the Garrison Graveyard. 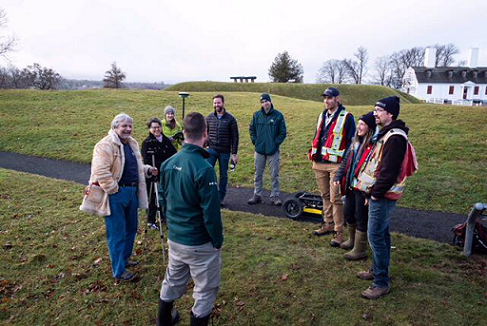 With these exciting results, Boreas Heritage, in partnership with MAPANNAPOLIS and Parks Canada, intends to expand its geophysical survey to search for other buried features at Fort Anne National Historic Site.